Welcome to the best list of Football Manager 2018 top bargains by FMSCOUT.com. Football Manager enthusiasts are always looking for bargain buys to shape a good team without breaking the bank. This guide is the most in-depth list of Football Manager 2018 quality players you can buy on the cheap. 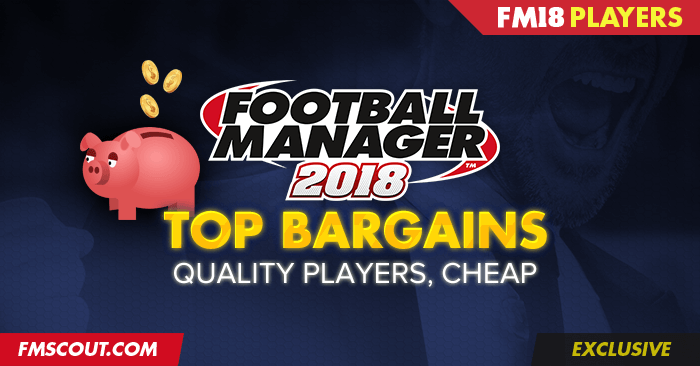 Part of our FM 2018 top bargains article series. Roughly 200 FM18 bargain buys included. I'll be updating this list often based on your feedback. This is the successor of our popular list of FM 2016 top bargains. Regrettably, we didn't do such a list for FM17. What are FM18 top bargains? Top bargains means quality players you can get for a relatively cheap price. You can filter players by any data you like from all tables below, such as ratings, names, nations, clubs and wages. Start typing and matching results will be shown in real-time. For example, typing "Brazil" will show you all Brazilian bargains. I loaded all 343k players in-game to produce this list of FM18 top bargains. Your savegame probably has less players loaded. I think you missed some players! Oh, and that player shouldn't be here! I'm counting on your feedback to improve this list, so I encourage you to post your suggestions in the comments section below. Thanks! Sorry, I don't have one. I used to share shortlists before, but people would steal them and post on other sites without my consent. 4 comments have been posted so far. Sebastian Govinco's ‎£5.5 million release clause from Toronto FC is an absolute bargain! GK - Rok Vodisek (Olimpija Lublana), cheap as chips, but great potential, Radoslaw Majecki (Legia Varsav) - same, young and can be a star in a near future. DC - Dario del Fabro (Juventus), Mateusz Bondarenko (Legia), DMC - Felix Horn Myhre (Valaerenga),CM/ACM - Reko Silva (Braga), Mateusz Praszelik (Legia), LW - Hicham Khaloua (Almeria), Andre Ribeira (Braga). Firmly recommending all of them.